Tanigami Konan was born 1879 in Hyogo prefecture and is a well known Kacho-e (birds and flowers) Nihon-ga artist. He was the first Japanese artist to paint Western flowers and is renown for his vivid, true-to-life painting of flowers. Tanigami Konan produced five volumes of pictures of Western plants which were published by Unsodo circa 1917/18. This series is called 'Seiyo Soka Zofu', (A Picture Album of Western Plants and Flowers). Depicting lush flowers and exotic plants in full bloom and organised as a visual record of garden flowers, two volumes each were devoted to the spring and summer seasons, while the 5th volume combined the flowers and plants that flourished in the autumn and winter seasons. 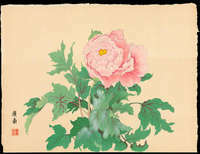 Konan is mostly known for his signature peony series. 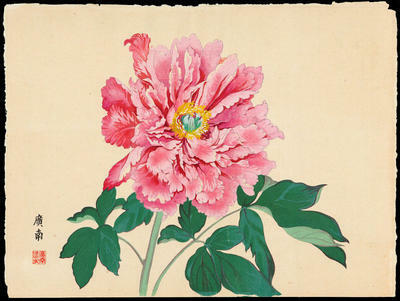 In 1917 he was selected to produce a series of twenty-four peony prints for the Teiten (Imperial Exhibition). I do not know much about this series (available information is very scant) so I will allow Fuji Arts to describe this series: The Peony Series from the Imperial Exhibition: In 1917, one of Japan's famous naturalist artists, Tanigami Konan, was chosen to produce a series of beautiful peony prints for the Teiten (Imperial Exhibition). Because of the importance of this auspicious occasion, all of the traditional Japanese works of art were to be produced to the highest standards. 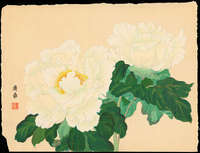 The Peony series by Konan was one of those selected traditional Japanese works. Konan designed and printed a lovely set of 24 peonies.These beautiful original woodblock prints were printed in an extra large format, and are unusually large for kacho-e woodblock prints. Bold, bright, and beautiful, they are some of the finest floral designs ever printed in the woodblock print world. They are all excellent quality, finely printed on beautiful handmade paper with a 'natural' untrimmed edge. 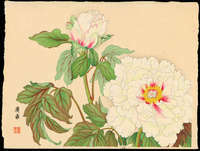 Unlike some of the smaller and more commonly produced floral subjects in the Japanese woodblock print world, and in the botanical print world in general, these Tanigami Konan peony prints are large, exceptional, eye-catching designs that would make a beautiful traditional Japanese centerpiece in any room. After the Teiten Exhibition, the 24 peony scenes were republished in 1923 in two picture books as volumes one and two of a three-volume series entitled 'Shokei Kakicho' (A Book of Flower Shapes and Forms). The third volume is slightly smaller in size and contains ten prints of both peony and other flowers, the scenes having thin black borders as shown here. Each of the first two volumes held twelve scenes, while the third volume held ten scenes. The three volumes were republished in 1926, and (at least for the third volume) 1929. Obviously prints taken from the picture books have vertical centre-folds, and prints in the first two volumes somethimes included titles (depending on the edition, I believe). Purchase two or more prints from this series for a 10% discount off each print (email me the item numbers of your desired prints). I am not sure of the exact edition of the Teiten Exhibition series prints below, but the data provided by Fuji Arts above suggests they are from the first edition, and the paper characteristics (some wood pulp embedded in the paper, some toning) suggests 1910s/20s vintage.